Product prices and availability are accurate as of 2019-04-23 17:51:47 UTC and are subject to change. Any price and availability information displayed on http://www.amazon.com/ at the time of purchase will apply to the purchase of this product. Bobby Hull gave the upstart World Hockey Association instant credibility when he signed with the Winnipeg Jets in 1972. With the arrival of a new breed of players - highly skilled Europeans Hull and the WHA Jets would then elevate major league hockey to new levels. Gordie Howe and his sons Mark and Marty had a similar effect on the fledgling Houston Aeros, starting in the WHA s second season. They led the Aeros to back-to-back WHA Championships in 1974 and 1975, and brought Mr. Hockey s unique style to a new generation of hockey fans. Together, the WHA Winnipeg Jets and Houston Aeros were the best of the World Hockey Association from 1972-1979. One of the two teams played in each of the league s seven championship series, with Winnipeg winning three league titles and Houston winning two. Now their story can finally be told in this new 2-DVD box set. 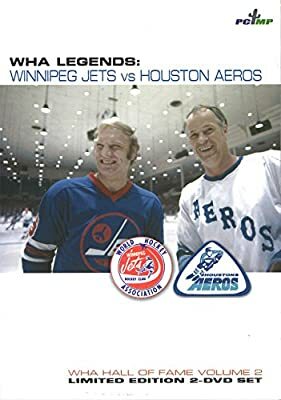 DVD DISC ONE features exclusive new documentaries for both the Jets and Aeros, extensive game highlights between the two teams, and newly discovered game film and video footage of the WHA Jets and Aeros against the powerful USSR and Finnish national teams. DVD DISC TWO features the rarest of media artifacts for the WHA: a complete, restored game from the original broadcast master tapes. Also on DISC TWO is the new electronic book Winnipeg Jets: The WHA Years Day By Day by historian Curtis Walker. This is the second installment of the three-part WHA Hall of Fame documentary video series. Volume One is titled Gretzky, Indy & The WHA, and Volume Three is titled Remembering the WHA.